The top 5 countries for solar energy photovoltaic installation capacity in 2015 were China, Japan, USA, Germany and India. As per GTM Research's prediction for 2016, the 2016 global solar energy installation capacity will probably increase by 43% to 73 GW. According to the prediction, China will still have the largest photovoltaic power plant installation capacity in 2016. Since 2012, China's photovoltaic installation capacity has presented explosive growth with an average annual growth rate of 88%, of which the average annual growth rate of ground photovoltaic power plants has reached as high as 106.79%. The yearly newly increased photovoltaic installation capacity in 2015 was 15.13 GW. 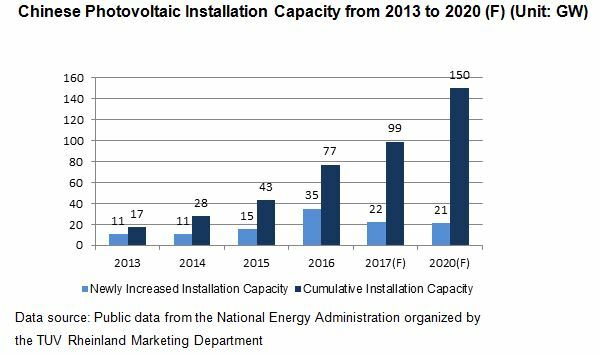 China continues to have the largest newly increased photovoltaic installation capacity. In the Notice on Implemetation Plan for 2016 Photovoltaic Power Generation Construction issued by the National Energy Administration, the scale of newly increased photovoltaic power plantsplant nationwide in 2016 was 18.1 GW, of which the scale of photovoltaic power plant projects was 12.6 GW and the scale of bases under Photovoltaic Product Top-runner Certification Scheme was 5.5 GW. In addition to setting goals, the Notice proposes tracking the index implementation and power generation status of power plants. It shows that, having benefited from the implementation of policies, photovoltaic quality and risk control have received extensive attention, and China's photovoltaic installation capacity has experienced significant growth, driving its photovoltaic industry to a stage in which quality can be emphasized. China's added installation capacity in 2016 was 35 GW and its total installation capacity in 2016 was 77 GW, both exceeding the predicted capacity according to the 13th Five-year Plan for Solar Energy Development issued by the Central Government. By the end of 2020, its total solar energy installation capacity will be more than 150 GW, and this is just a goal rather than a limit. In the current situation, it is a matter of necessity that the total installation capacity during the 13th Five-year Plan exceeds 150 GW. In the construction process of power plants, although each phase seems to be independent, experience shows that each phase will affect the next and the final profits of the investment at different moments and to varying degrees. If we ignore the warnings identified in a certain phase or fail to cautiously implement the confirmation and improvement work of each phase, the power plant may suffer losses, and this is adverse to its continuous operation. Power plant enterprises should master complete and effective risk control schemes, and introduce authoritative, just and independent third-parties to conduct the risk control of the entire process of power plant projects. Combined with its years of practical experience, TUV Rheinland makes a point of aiming at the potential problems in all phases in the White Paper, adopting solutions and carrying out tests. The life cycle of a photovoltaic power plant is generally 25 years, the beginning of which is the completion of construction. The trials and challenges faced by the power plant industry involve how to maintain their operation and actual profits. Professional maintenance and operation services can achieve the effects of reducing operation risks and human costs; however, currently, there still no standard for identifying a professional operation and maintenance company in China photovoltaic industry. TUV Rheinland believes operation and maintenance companies can give full play to their real effects after they receive fair evaluation and recognition, The three main factors in selecting an operation and maintenance company are experience, technology and certification, of which operation and maintenance certification is used to normalize the management system of operation and maintenance companies; it consists of two parts: 'pre-review of existing O&M power plant' and 'final review after rectification'. The term-by-term review and quantized rating mechanism of the two parts provide objective third-party data for power plant enterprises to determine the ability of operation and maintenance companies. The rating standards of photovoltaic power plant operation and maintenance certification formulated by the TUV Rheinland Headquarters consist of 8 items, each item is divided into dozens of sub-items. It is a precise and comprehensive evaluation method which enablespower plantenterprises to estimate the ability and quality of O&M companies via scientific rating. Due to their long life cycle and stable profit recycling, photovoltaic power plants are regarded as financial investment commodities. As such, risk problems should be taken into account in the overall profits in the earlier stages of a power plant project. Whether the owner, investor, lender or insurer of a project evaluates the investment of a photovoltaic power plant, they will all consider the variations of various risks. However, because of the asymmetry, opacity and incredibility of the information, all parties seem to be conservative and find it difficult to evaluate their own investment. A third-party testing, inspection and certification company is capable of playing the role of solving information asymmetry and eliminating trust fences by virtue of it owns strengths, including plentiful experience, professional technology and impartial fairness.